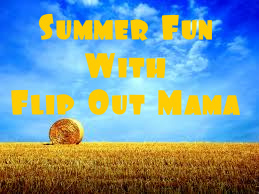 Flip Out Mama: Summer Fun: Glow Crazy! Well things are finally calming down around here, with the boy's birthdays behind us and school finally over.. I am so glad that the boys are finally having time to play with all of their great birthday gifts! Tater received his favorite birthday gift not from me, (well, not TECHNICALLY...), but from Glow Crazy! If you have kids, you have probably seen the Glow Crazy commercials on TV. I have been really intrigued by this toy since I saw the advertisement for it. It just looked so cool! 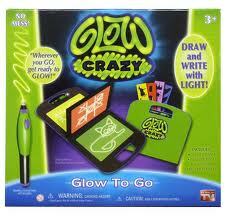 We received the original Glow Crazy Distance Doodler, and we were so excited to try it out! With the Glow Crazy Doodler, you can draw ON THE WALL with no mess! That's right, I said DRAW ON THE WALL! Tater was so excited about this, but also a little afraid that he would make a mess. That's just how he is, silly boy! You get the wall clings, the lightwand, and a few stencils if you can't decide what to draw.. It's super easy to use, you just stick the wall cling on the ceiling or wall, wherever you want, turn off the lights and you are good to go! I love that it's so simple to use! The Glow Crazy allows you to draw up to ten feet away using your light wand, and if you want to erase your drawings, guess what? You turn on the light. Simple as that. LOVE IT! Tater loved this toy just as much as I thought he would! He is a little artist anyway, so I knew this toy would be perfect for him. Now the hardest part is keeping the light wand away from him at bedtime! I can't wait to post some pics to show you guys how cool this toy is, but it will have to wait until I find the missing camera (I know, you guys can't believe I lost something!) But, take my word for it, this is a great toy! 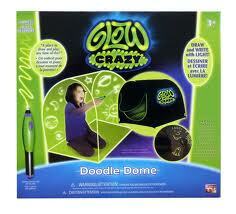 The folks at Glow Crazy have some other great products, including the Glow Crazy GlowTo Go, and the Doodle Dome. These are already on Tater's Christmas list! If you would like to check out Glow Crazy's awesome and MESS FREE toys, click here! disclosure: I received a sample product in order to conduct this review. although a sample product was received, all opinions are my own, and no monetary compensation was given!